Let me start off by saying that I had a bad experience with an ATI based video card many years ago. I made the switch to NVIDIA and never thought about giving ATI/AMD another chance. When I was offered the Gigabyte Radeon HD 7870 2GB GHz Edition video card for review, I was apprehensive. Gigabyte has a reputation for making great motherboards. I have heard that the AMD Radeon HD graphics cards had become much more stable and that the more well-known manufacturers had increased the quality of the components from when I last tried them, so could my mind be changed to support AMD Radeon cards after a bad experience years ago? It’s hard to say, but I was willing to give it an honest look to see how it would do on my setup. The Gigabyte HD7870 features three ultra quiet fans with a blade diameter of 76mm (7.6cm), more commonly called 80mm fans, cooling the heatsinks and three 8mm heat pipes. The HD7870 has a black color scheme that should look good in virtually any system. The fan shroud doesn’t have any markings but does have a high gloss finish. This card currently sells for around $189.99 at Newegg under the part number GV-R787OC-2GD. While the sample we received is an OEM white box, purchasing this at retail will not only will you get a pretty box, but a CD with software, two power adapter cables, a Cross-Fire bridge, and a 3 year warranty. Here we can see the video connectors for the Gigabyte HD7870 video card. From the left, it has a pair of mini-Display Port, HDMI and a DVI-I. Above the video connectors is a vented expansion port cover as this card will take up two expansion slots. Not much is expected to be on the back of the video card, we can see a few of the mounting screws for the heat sink but nothing else that would get anybody excited. The blue PCB is 9.5″ in length, and should fit in almost every case; however the heatsink extends past the PCB taking the total length necessary for installation to 10.25″. 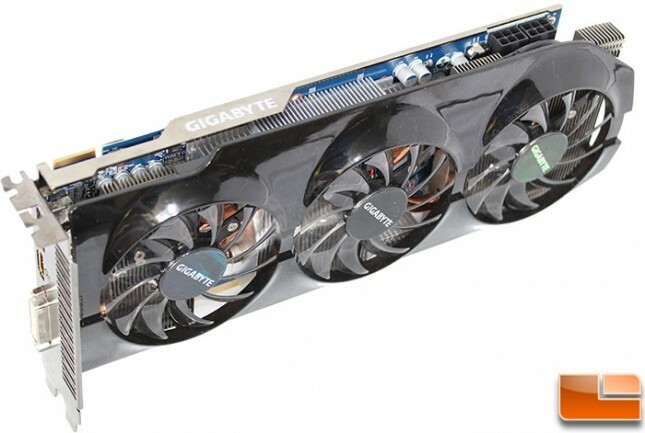 Gigabyte states the dimensions of the card are 42.5mm x 280mm x 134mm(H x L x W). With one CrossFire connection, it’ll support two cards in CrossFire mode. The top edge of the card has a nice metal support arm that has the Gigabyte name on it; this is a great place for it as it’ll be easily seen once it is installed in the case. On the right edge there are two 6-pin PCI-E power connectors, for the HD7870, Gigabyte recommends a minimum power supply of 500W. Gigabyte’s Windforce 3x with Triangle Cool technology keeps the card running cool. This system has the fins on the heatsink inclined to reduce air turbulence, and to help with heat. The Triangle Cool technology refers to the combination of angled heatsink fins, and a clip module. Gigabyte says this increases the efficiency of heat dissipation and makes the air flow more efficient. For more information you can check out Gigabyte’s Windforce 3x microsite. Lower GPU Temperature – Ultra Durable VGA board provides dramatic cooling effect on lowering both GPU and memory temperature by doubling the copper inner layer of PCB. Better Overclocking Capability – Ultra Durable VGA board reduces voltage ripples in normal and transient state, thus effectively lowers noises and ensures higher overclocking capability. Decrease Power Switching Loss – Ultra Durable VGA board allows more bandwidth for electron passage and reduces circuit impedance. The less circuit impedance, the more stable flow of current and can effectively improve power efficiency. Patented “Triangle Cool” Technology – GIGABYTE introduces the latest exclusive “Triangle Cool” Technology to reach a better cooling performance. The latest patented technology combines fin with clip module in a special triangle shape. With the original anti-turbulence structure plus the new triangle cooling design, it enhances the efficiency of heat dissipation dramatically by minimizing the flow of turbulence between fans. Therefore, the “Triangle Cool” Technology provides a more efficient air flow for the cooling system. An AMD 7870 reference card comes clocked at 1,000MHz core speed and 1,200MHz memory speed. While the Gigabyte HD7870 comes clocked at 1,100MHz core speed, and 1,200MHz memory speed. This comes to a 10% factory overclock on the core. 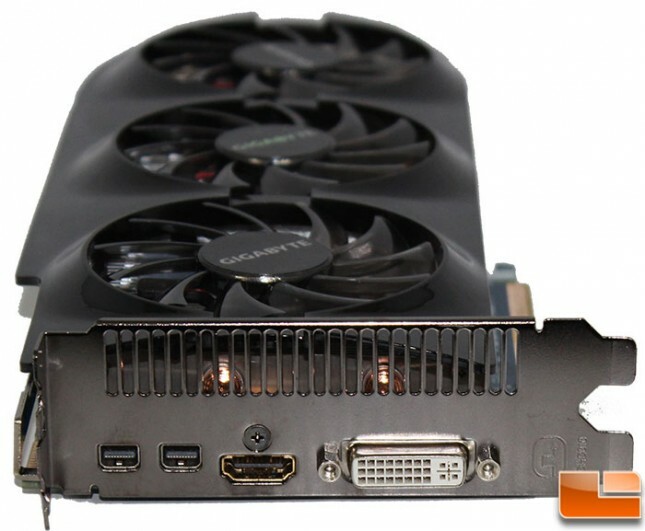 Purchasing a video card based on the Radeon reference design, such as the PowerCooler AX7870, currently selling for $164.99 after a $25 rebate; a $45 difference in costs, for a 10% factory overclock, and a triple fan cooling system.